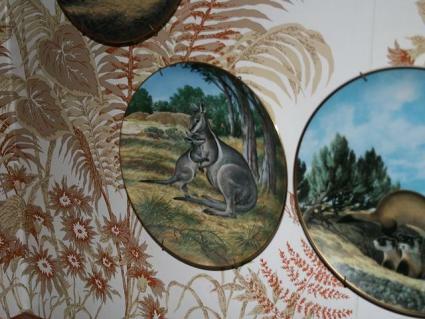 Wild animals are some of the most common themes for collectible plates. Collectible plates are some of the most beloved collectibles today. Their subjects range from abstract and fine art to popular culture and they are designed to appeal to theme collectors (such as Star Wars, I Love Lucy, Santa Claus, Coca Cola, cats, John Wayne, etc.) and plate collectors alike. People have been collecting plates since the first porcelain was invented around 600 AD. But most experts agree that the first truly collectible plate was Bing and Grondahl's blue and white Christmas plate "Behind the Frozen Window," issued in 1895, the first known limited edition plate. (Bing and Grondahl have continued that line to this day.) Other companies soon followed, driven both by technical improvements that made porcelain easier and cheaper to produce and by the rising middle class who could afford factory-produced plates for display. Royal Copenhagen and Rosenthal were among the most popular. Virtually all collectors' plates issued during the first half of the 1900s were blue and white Christmas plates. Blue and white had in fact been one of the most popular color schemes for porcelain since its early invention and antique Chinese and Middle Eastern and Turkish blue and white tiles, jars, and other porcelain items today can sell for hundreds of thousands of dollars. In 1965, though, Lenox introduced a dual innovation, lead-crystal plates and colored plates, and these opened a whole new world of options for collectors' plates. At first, most collectible plates came from Europe, but United States companies started to create their own lines as well. Popular artists began to create or license designs for collectors' plates, as did popular movies. Animals became very popular as themes. The Bradford Exchange is one of the best known dealers in and producers of collectible plates and is famous for starting the equivalent of a stock exchange for collectibles. In 1973, J. Roderick MacArthur issued a "Current Quotations" list for collectible plates that essentially standardized the previously much more informal market. A decade later, it introduced an electronic system and began to emphasize its own lines of plates, including the then revolutionary three-dimensional sculpted plates. Their Studio Dante di Volteradici's Grand Opera and Incolay's bas relief Romantic Poets were deliberately chosen to appeal to up-market collectors interested in grand opera and 19th century poetry. Rockwell Society of America: These are some of the most popular collector plates as well as one of the longest running lines. Hummel: Hummel's plates use the same popular designs as their figurines. Bing and Grondahl: In addition to their famous Christmas lines, Bing and Grondahl also have a Mother's Day series featuring animal mothers in their trademark blue and white. Condition, visual appeal, and rarity are the major factors in price. Collectible price guides have information about prices for plates and sets, as does the Bradford Exchange website. You can buy plates online from auction sites as well as specialty online vendors. Of course, buying in antique stores lets you examine your merchandise beforehand, an important consideration with fragile items like collectible plates. Because would-be fakers need to invest in equipment and because most collectible plates are relatively affordable, plate buyers do not need to worry as much as other antique collectors but still need to look out for antique reproductions or forgeries of the more expensive plates. Usually the details are the giveaways, so it's good to have pictures of the originals of any particularly expensive plates.